The Oneway, Talon and Stronghold Chucks are now available without the #2 Top Jaws, Jaw Screws and without the Screw Center. This is good for people getting a second chuck for a specific use or people wanting to use a different set of top jaws from the start. If needed the Screw Center must be purchased separately. Jaw screws come with each set of optional jaws. 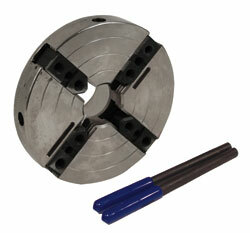 The chuck adaptor needs to be ordered separately below.